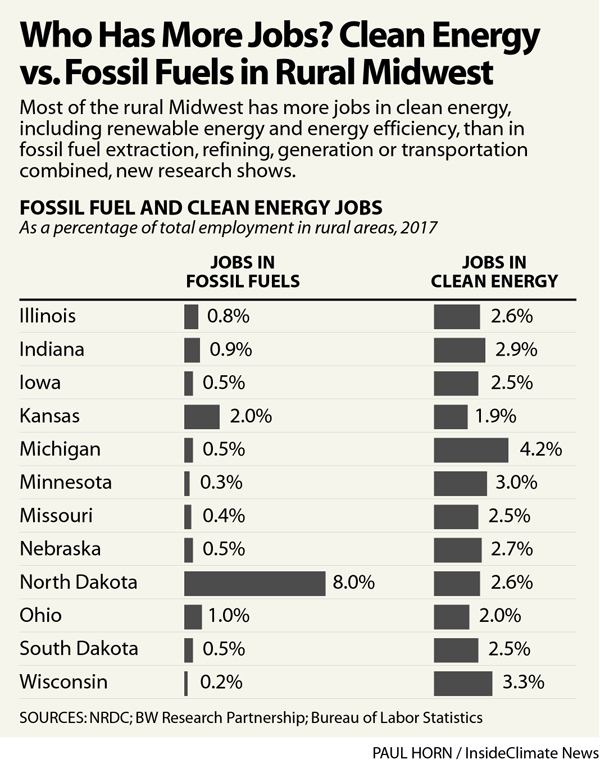 A 2018 report from the Natural Resources Defense Council shows the extent to which clean energy is contributing jobs to the rural economies of 12 Midwestern states. It also reflects what the rural Midwest stands to lose from Trump administration actions that harm clean energy, such as its recent call to eliminate subsidies for renewable energy, its tariffs on solar energy equipment, and its plan to weaken the Obama-era Clean Power Plan. In 2017, the latest data in the report, clean energy employed about 158,000 people in the rural Midwest, according to the Natural Resources Defense Council. 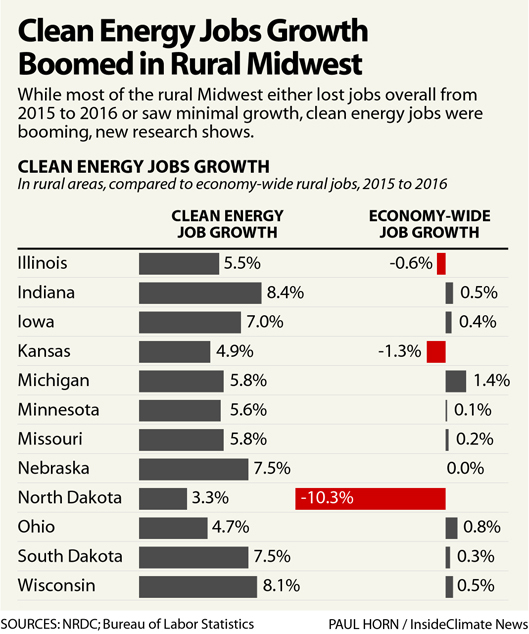 While a larger number of clean energy jobs overall were in urban areas, the rural clean energy jobs stand out for making up a bigger percentage of the overall rural economy. Meanwhile, renewable energy has been booming in the region as prices have fallen and wind power has become cheaper than both coal and natural gas in many areas. In 2017, the Midwest added 31 gigawatts of wind and solar power plants, 24 gigawatts of which are located in rural areas, according to government data cited by the Natural Resources Defense Council. For some perspective, the country's largest coal-fired power plants are 2 or 3 gigawatts each. A growing number of cities, including Cleveland and Cincinnati, have committed to transitioning to 100 percent renewable energy, and much of that power will likely be produced in rural areas. The Natural Resources Defense Council used definitions of fossil fuel jobs and clean energy jobs developed by BW Research Partnership, an economic research firm. Fossil fuel jobs include production, transportation and marketing of fossil fuels, along with jobs at power plants that run on fossil fuels. Clean energy jobs include those related renewable energy power generation, clean transportation and energy efficiency. The majority of clean energy jobs in all 12 Midwestern states are in energy efficiency, the report says. That includes building design, energy efficiency upgrades and other aspects of reducing energy use that save people money on energy costs while also reducing the greenhouse gas emissions that are warming the planet, triggering climate changes that put Midwestern farms at risk. That clean energy is a boon for the rural Midwest doesn't surprise Katie Rock, a policy associate at the Center for Rural Affairs, a Nebraska-based nonprofit that advocates on behalf of small family farms and rural communities and was not involved with the report. Clean energy is "quickly changing the landscape of rural communities," she said, adding that Midwesterners "take a lot of pride" in being leaders on clean energy. Iowa is the No. 3 state for total wind power capacity, and it's the leader when it comes to the amount of in-state electricity produced by wind; Kansas and Illinois are fifth and sixth in total wind power capacity, according to the American Wind Energy Association. Yet the report's findings may surprise some people, and that's part of the point, said Arjun Krishnaswami, a co-author of the report and a Natural Resources Defense Council policy analyst. He thinks that much of the country, even people in the energy sector, have been slow to realize that the clean energy economy is much more than a coastal phenomenon. As state and local leaders become more aware of clean energy's role in rural Midwestern economies, officials may be more likely to back supportive policies. Editor's note: InsideClimate News is a non-profit, non-partisan national news outlet that covers climate, energy and the environment. This article was originally published on Dec. 7, 2018.